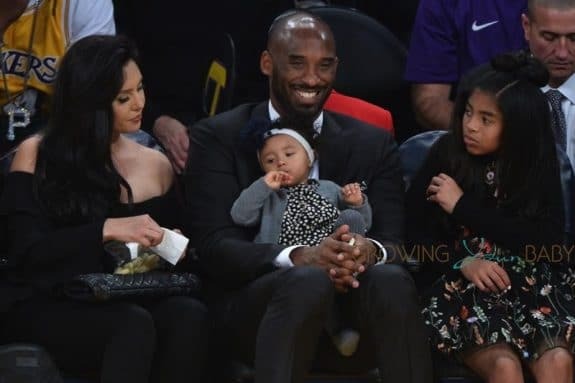 Kobe Bryant was photographed sitting court side with daughters Natalia Diamante Bryant, Gianna Maria-Onore Bryant, Bianka Bella Bryant, wife, Vanessa Bryant and mother-in-law, Sofia Laine in the first half prior to the Lakers retiring his #8 and # 24 jerseys during a half time ceremony on Monday December 18, 2017. The 18-time All-Star played his entire 20 year career with the Lakers. During that time he led the NBA in scoring during two seasons, and ranks third on the league’s all-time regular season scoring and fourth on the all-time postseason scoring list. His retirement was definietly well earned and his family was thrilled to be there to share it with him. 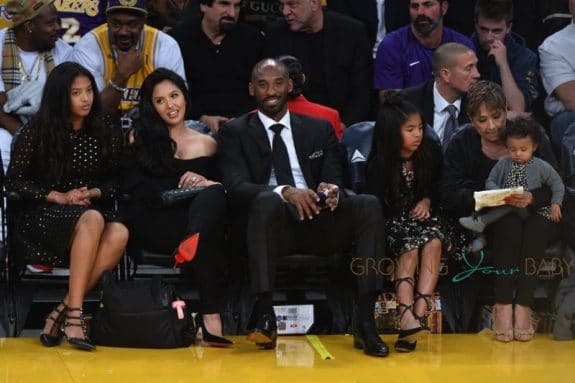 Kobe is only the 10th Lakers player to have his number retired, joining Wilt Chamberlain, Elgin Baylor, Gail Goodrich, Magic Johnson, Abdul-Jabbar, Shaquille O’Neal, James Worthy, Jerry West and Jamaal Wilkes.